Tibetan murals are masterpieces of Tibetan painting art. They are being carved on walls of temples, palaces, houses, hotels and so on. But the monasteries are murals gathering places compared with other sites. Large monasteries usually have hundreds of halls, each hall and its corridors, ceilings are painted with Tibetan murals. According to the statistics, there are over 10 million murals in the monasteries. 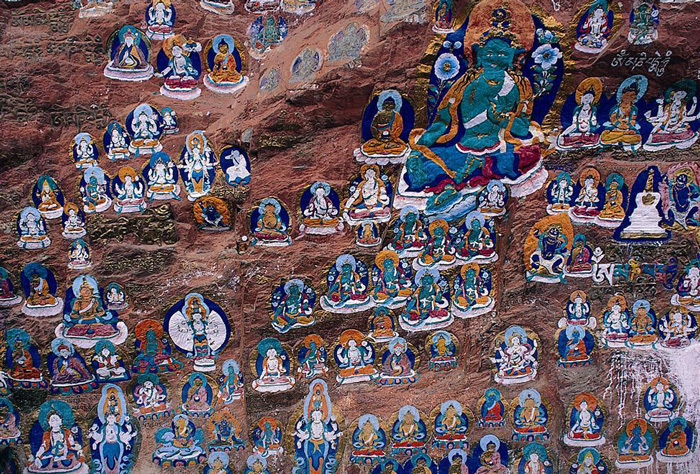 In the past, Tibetan frescos developed from the early rock paintings on the cave. 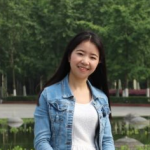 Moreover, rock murals are mainly about animals, ancient social lives and hunting scenes. And, the fabulous murals were carved on some caves in Tibet. The earliest reference of Tibetan murals was a famous Swedish explorer. He mentioned the murals in his book that he found a rock mural in a valley of 4500 meters above sea level in Northern Tibet. This rock mural carved with hunters were catching antelopes with bow in their hands. Besides the event, there are also other people who claims that they had seen the Tibetan murals once in Tibet plateau. Till now, scientists have already found almost 60 mural locations recording thousands of images in Tibet region. 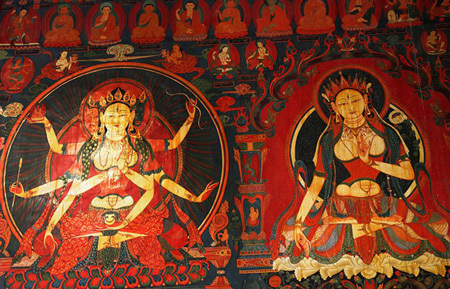 The Tibetan murals encompass rich categories, involving culture, history, social life, economy, politics, and religion. Among all of those Tibetan frescos, yak pattern mural is one of the most unique murals that combines the characteristics of plateau. Yak is the typical animal in Qinghai-Tibet Plateau. Tibetan Yaks, with a fat body and long hair, can resist cold and are capable of carrying a heavy load long distances, so they have long been an important transportation “tool” on the plateau. Except the yaks, religious murals are also one of the most popular Tibetan frescos. If you travel to Tibet, you can see many Tibetan murals of Buddha figures. For example, Jokhang Temple and Tashilhunpo Monastery owns a special courtyard to dedicate these religious murals. Meanwhile, the color procedures are as complicated as Thangka. So Tibetan murals have the same value as Thangka. The two painting arts are the great artistic forms of Tibet. They have reflected the development of Tibet from many aspects. For more information about Tibet culture and art, please refer to our Tibet Travel Blog.